LETTER of INVITATION from Family of Childhood: Sincerely invite you to visit the Attractions Expo 2019 in Beijing China. Guangdong Family of Childhood Industrial Co., Ltd., founded in 1988 and located in Qingyuan, is not only an integrated amusement equipment enterprise in the aspects of product creation, design, manufacture , sale and service, but also the main manufacturer and supplier of nursery educational accessories and outdoor theme park. Family of Childhood attaches great importance to product research and development, also, is committed to providing customers with the most creative products and design solutions, providing children with fun and vitality. Hence, every need of customers is the driving force and direction of our progress. 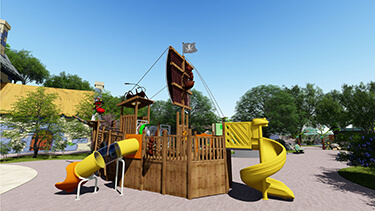 We have a professional elite service team, tailor-made a set of sustainable profit model service system for customers; from the overall planning,market research and analysis, the whole garden design planning, production and construction, operation and maintenance one-stop Services to create a unique children playground. Of course, we have done a lot of large theme park projects at home and abroad. the practicality of Children playground,make it become one of the most popular places for tourists. to explore the unknown world in this outdoor theme park . visitors enjoy the enthusiasm of the game and also the freshness of creativity. parent-child experience for families who come to vacation and leisure. Above all,we have accumulated a lot of experience in the design and construction of standardized and non-standard outdoor playgrounds. Furthermore, we look forward to building more themed playgrounds with our customers to enrich their childhood.Certainly, we welcome more end customers to contact us directly, we provide factory ex-factory price. Also, you may see our company at the Canton Fair and various amusement equipment exhibitions abroad.